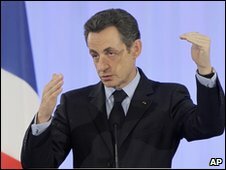 France's public debt has risen to a new high of 76% of economic output after additional state spending during the downturn, figures have shown. The national statistics office INSEE said government debt stood at 1.46 trillion euros ($2.1tn; £1.3tn) at the end of September. This was an increase of 29.4bn euros since the end of June. 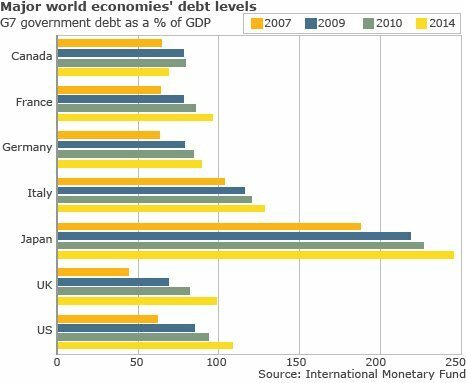 Debt levels of all major economies have risen sharply as governments have tried to spend their way out of recession. French government spending helped the country's economy to emerge from recession between April and June. Lower tax receipts have also contributed to spiralling debt levels. The 1.46tn euros is the largest debt France has run since INSEE records started in 1995. According to forecasts from the International Monetary Fund (IMF), French public debt as a percentage of economic output will hit 96% by 2014. Of the G7 economies, this is less than Japan (246%), Italy (129%), the US (108%) and the UK (98%), but more than Germany (89%) and Canada (69%), the IMF has predicted.